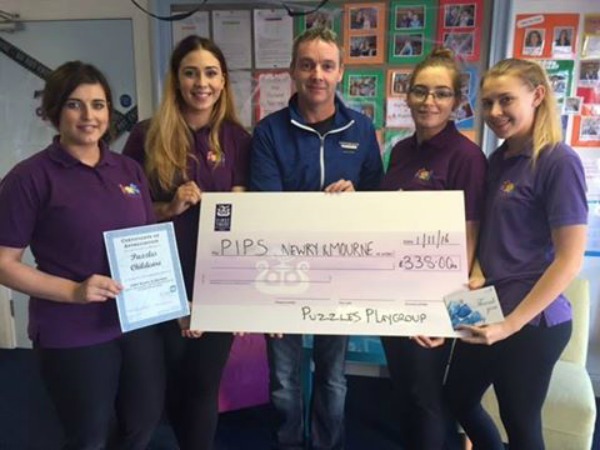 Lindsay Quinn, Leona McGarry, Leanne McKinley and Clare Mathews from Puzzles Playgroup Cloughoge Newry are pictured presenting a donation to Eamon Murphy of PIPS Newry and Mourne. The Puzzles staff raised these funds through participating in the recent event 'Up The Canal in a Bubble' held by the charity. Thank you girls, for your fantastic support.